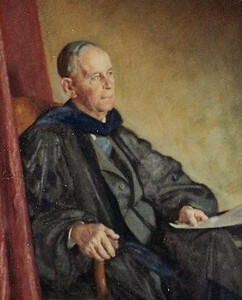 George Norlin (1871 – 1942) was president of the University of Colorado from 1919 until he retired in 1939; he was named acting president in 1917. The university library is named after him. George Norlin wrote essays and gave speeches which were critical of the Scopes "monkey" trial. He rebuffed the blandishments of the Ku Klux Klan governor of Colorado, who offered him legislative support in return for firing Jewish and Catholic faculty. After a year in Germany as lecturer on American Civilization at Berlin University in 1933, Norlin spoke and wrote articles warning of the dangers of Nazism and anti Semitism. Hitler, he told a journalist, was not someone with whom you could go fishing. Unfortunately, few listened to Norlin's warnings. Like Churchill, he had the dubious fate of living just long enough to see his warnings come true.